1. In matches that India won from 1996-2009, Dravid has the Lion's share aggregating 4058 followed by Sachin with 3558. 2.If we also consider the drawn matches along with the matches won, Dravid has 8819 followed by Sachin with 7542. 3.He has aggregated the most overseas runs among Indians with an average of 57.7.Rahul is behind Ponting who has an average of 59.61 overseas. 4.Wisden uses a unique scale to determine the efficiency of a player.It is the ratio of no of successes in 3rd or 4th innings to the no of failures.Among the Indians, Dravid has the efficiency of 0.791 followed by Laxman with 0.756 and Sachin 0.729.Ponting leads with efficiency of 0.85. 5.He has the highest 3rd / 4th innings average of 44.27 while Sachin has 40.71 for India.Sunil Gavaskar leads the Indian tablewith average of 58.10. These stats were found out by a Rahul fan and posted on Orkut.I am thankful to him. An amazing player the man from Bangalore is isn't he? yes Rahul dravid is the amazing player in any format and also perfect sports man thany any other players.because he is the only player and the definition of gentle man cricker and very cool and realible cricket player and he the man having good attitude. No doubt! rahul is greatest of all times just like federer in tennis.rahul is a real gentleman and never let the country down. i hope he comes back in odi and t20 team.i would love to see him play in t20.He is a real teamman and best ever. for me he is even better than don bradman.we will never see another wall ever. And yes gambhir is not the second wall , he can never be. rahul is the legendary batsman. 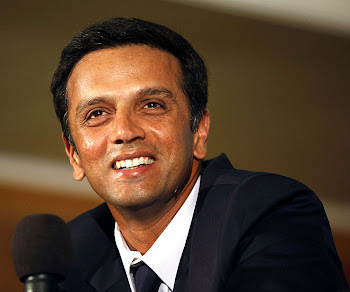 hi rahul dravid i am requesting you that i have a blog http://utsavlalan.blogspot.com this blog is made to leave smoking,beer and non veg food.To leave these things only you need is control your mind and all the visitors to the blog please read my blog and please do leave a comment.